We welcome children, ages Pre-K - Senior High. 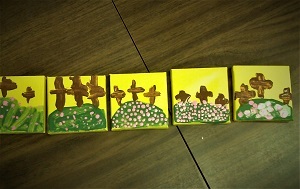 Time: 9:15 - 10:15 a.m.
Zion's Sunday school classes painted mini canvases for the Lenten Season. Grades 6 and older are involved in learning the six chief parts of Luther’s Small Catechism through a three year program that uses Faith Inkubator’s Head to the Heart curriculum. Students learn together in a large group setting for an hour and then break out into small group mentoring with adults from the congregation for the last half hour. Parents are encouraged to participate in the program with their child so that the entire family grows in their faith. All students are encouraged to receive their first Communion in the spring of their 8th grade year. After successfully completing three years of study the student may choose to confirm his/her faith on the following Reformation Sunday. We gather together every Wednesday night to learn The Lord's Prayer, Ten Commandments, and other bible history to help prepare young minds for their entry into the comfirmation program. Each lesson consists of scripture, memory work, prayer, and fun! Youth Night All ages welcome! Watch for postings of when our next Youth Night will be!